Experience the world’s greatest live tribute show! Legends in Concert continues to celebrate 35 years as the longest-running show in Las Vegas with an incomparable cast of music legends. 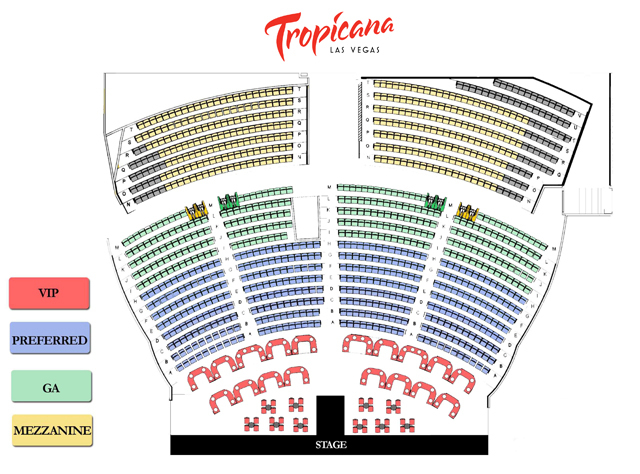 Set to debut at its new home inside the Legends in Concert Theater beginning February 11 2019, tickets are now on sale for the all-new residency at the Tropicana Las Vegas. The acclaimed production features all-star talent from the world’s top tribute artists paying homage to renowned musical luminaries such as Lady Gaga, Elvis Presley, Whitney Houston, and Frank Sinatra. The legendary show will also dazzle fans with historic showgirl costumes curated directly from iconic Vegas productions of the past, creating a special tribute to the showgirl glamour that is synonymous with the Entertainment Capital of the World. The tribute artists perform using their own powerhouse vocals, and are backed by a sensational live band, singers, dancers and showgirls who bring music memories to life, and entertain audiences of all ages. Acts are subject to change. Line up for Feb 11 - 25: Whitney Houston Frank Sinatra Elvis Lady Gaga Legends in Concert is the longest-running show in Las Vegas history. The award-winning production is known as the pioneer of live tribute shows, and possesses the greatest collection of tribute artists in the world. These incredible artists have pitch-perfect live vocals and stunningly similar appearances to the legends they portray. Joined by a talented ensemble of singers and dancers, and a rockin’ live band, the ever-changing show is a nostalgic journey of musical experiences. A classic Vegas show at one of the Strip’s most iconic showrooms. An outstanding cast of accomplished tribute artists, talented ensemble of singers and dancers, and a live piece band comprised of some the industry’s top musicians, bring the musical experience to life. What started as a limited six-week engagement at the Imperial Palace Hotel & Casino in 1983, Legends in Concert has become an internationally acclaimed phenomenon and the longest-running tribute show in Las Vegas. Over the course of three decades, Legends in Concert has given more than 18,000 performances on the Las Vegas Strip and has been seen by more than 30 million fans worldwide. On any given night audiences are treated to a lineup of celebrity tribute artists, who perform and are backed by a live band, using their natural voices. The artists not only sound just like the stars they emulate, they are dead ringers for them as well—down to the last detail, including dancing styles, mannerisms, facial expressions, hair, makeup and costumes. On top of world-class performers, the show also features incredible back-up dancers and singers, elaborate sets, state-of-the-art sound and light systems, cutting-edge special effects and stunning costumes. Get your Las Vegas Legends in Concert tickets today and experience the show that has earned entertainment industry awards for "Show of the Year," "Entertainers of the Year," "Grand Slam" and the prestigious "Show of Shows" awarded by the International Press Association. Get your Las Vegas Legends in Concert tickets today and experience this show! All attendees must have a ticket to enter the theater.